Good evening, dear readers. This is my second post on the Medium, so I decided to write something good for any case, if I can tell so. The days when most webmasters and arbitrators did not have to deal with cloaking are in the past now. It has become much more difficult to make cash per a day on pop and redirect traffic. It is connected not only with the tightening of the facebook rules and Google Chrome browser updates toughening, but also with the new rules for Google advertising. We are also interrupted by the work of bot traffic, spyware, in particular, Adplexity — one of the most advanced mobile spy tools in affiliate marketing. Affiliates who work with traffic make a lot of efforts to test and search for good links, but competitors who know how to surf your ads or Adplexity bots will place your land or your domains on their services. It can disrupt all your work for the shortest time. The PEERCLICK tracker protects all your links with a special algorithm. There is no need in explaining the advantages of cloaking and all sorts of things like that. Surely you know it. The future has come or how does it work in PEERCLICK? — Compilation on-the-fly 2 types of system prints (FingerPrints) — on the basis of resolution analysis, versions Java/SilverLight/Flash, language of the SYSTEM, time belt, established adds in browser, established fonts in the SYSTEM, indirect analysis of video card/drivers, etc. Analogues of such program are present in PayPal/Adwords, but they were not used in cloaking by any other solutions. As a result change of IP, UserAgent and even browser (simultaneously) — won’t help to hide that this bot/spy already visited your website and was caught in a trap. — **Black and white lists. IP-addresses, FingerPrints, sources and key words all this is automatically on-the-fly analyzed and brought to black and white lists for you to see (automatically) from where you get more bots, from where you get more real people, what you need to turn off and what is to be strengthened to get more proficient traffic. The pass-through of UTM-marks, subID, and even PostBacks are also supported. 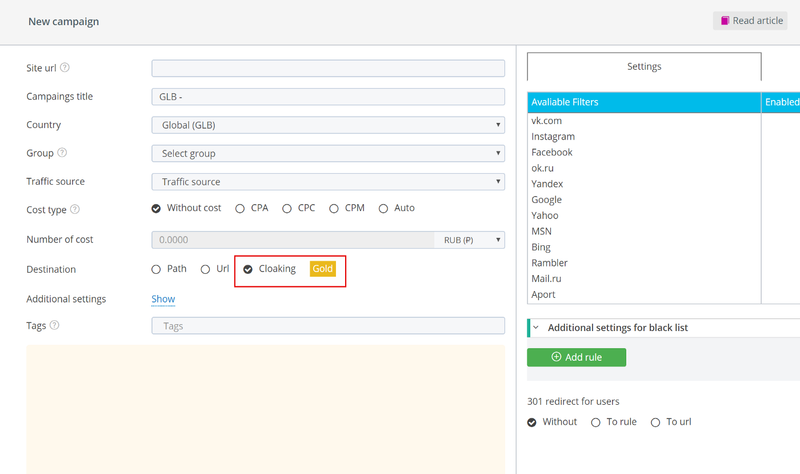 By the test results you will clearly see by which channels come more or less “Bot” traffic, it means you’ll be able to turn off the nonoperating links not tarrying for the testing budget losses for the test of sources of traffic sources/ links. Even in Adwords according to our tests — in average 35% bots. Do you want to pay for them further on to see negative ROI? Or we’ll turn them off at once? All that is needed from you to do this — write UTM-marks while giving URL to advertisement. The rest will be done by our complex and as a result will give prepared black and white (in convenient TXT files, separately). — **Overfiltration: If all the local tests are accomplished (and resolution of the screen isn’t 10х10 pixels and in local black-lists the click wasn’t highlighted with red), then the user «breaks through» by the internal IP base (aggregates on our server), and there it will be visible for sure (We don’t reveal this technology, because further on we plan to sell the solution to the Internet-shops for protection from frauds and carders): whether is used proxy /VPN/Tor/RDP dedicated server, or the traffic is clear. In short: are analyzed all the available online free and chargeable proxies, shops Socks/SSH, dedicated servers, and the bases IP are gathered, total volume of base of «dirty IP» is more than 200 million addresses. If user passes even this filter — he comes up (by meta or other type of redirect) to the link that you put in script. Otherwise — he gets replacement content. Analogically it is filtered by FingerPrints parameter. You won’t need to gather the base of fingertips of bots/spies by yourself, this base is already gathered and continues to increase by means of centralized functioning system of this module (it can be either turned off if wanted or switched to local mode). — **Replacement content: You mention link to any foreign website or lending and this website is inferred on your domain. No WGETs, deflations, creating lendings, just mention foreign website and it will be shown to bots and spies instead of redirect (they won’t see that redirect was designed). 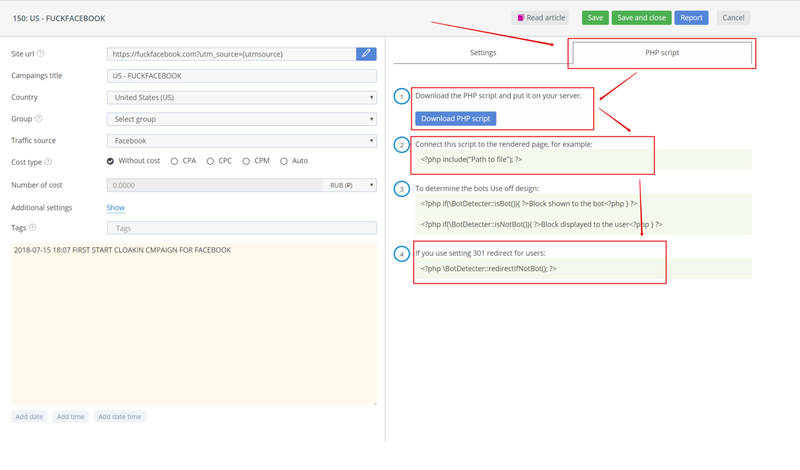 Uploaded website will be cached on the server not to load system resources with constant address to external sources, by the way — you can always correct the content of cached page. As an option, you can upload your local content/lending. — **The system is not strict to resources, it will get started even on shared-hosting and will bear 10000 people per day without drags. 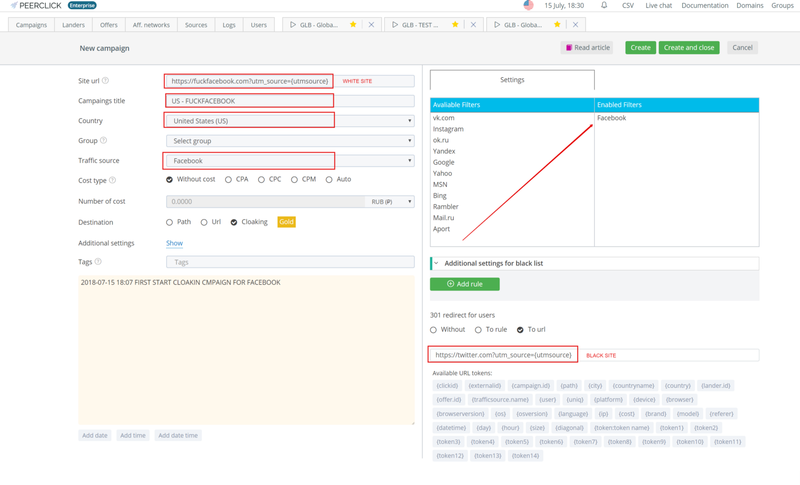 Then we go to our host or server and add there our white landing page, so that it shows up when the bots / moderator of the network that you have chosen for cloaking transfer to your site. What are the requirements for the domain? 1. A domain must have an HTTPS protocol (ssl). 2. The domain where will be a “white” site for bots and spies should not have been advertised earlier. 3. The domain where the main site will be (for ordinary users) — can be any. Then, we go to the PEERCLICK panel and start setting up the cloaking. Enter FACEBOOK in the search and click the “Add” button and save. Next, choose the country we plan to pour the traffic on, in our case it’s USA. Then, we look to the filters and choose “Facebook”. Be sure to configure additional rules. For example, if traffic is to Russia, then all other countries should be bots. You also need to select the type of device (for example, only the desktop). You can add more VPN / PROXY traffic filtering. Download the script on your computer and then take this file to the hosting and connect it on our site. We see in the archive a script with this name: 146–15FeYt, for convenience we change the name, for example, to playok or whatever you come up with. After that, we upload this file to your hosting into the root. And save the changes. After that, change the file format from index.html to index.php, otherwise our cloaking won’t be connected as it should be. Where index.php is the home page of the land, playok.php is the cloaking connection file. Check that your PHP is at least 7.0 version otherwise it will not work. Set up advertising by specifying a “white” site and wait for moderation. Don’t forget to pause a cloaking before these actions. 3. After moderation, turn on cloaking (put on the same button when it becomes green). That’s all. Bots and spies will see “white” site and users will see any site, that you have specified. As a result, we got a ready-made cloaking for draining the FACEBOOK traffic. 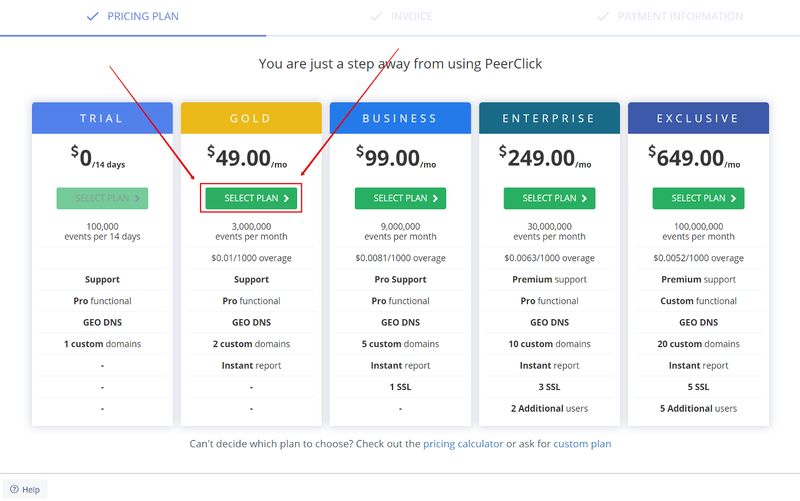 If you are still in search of the best cloaking service, look at this: we asked PEERCLICK about discounts especially for you. With the promocode below, you will receive a 50% discount for the GOLD account. The number of account activations with a promocode is limited. So act quickly and check out this powerful tool!